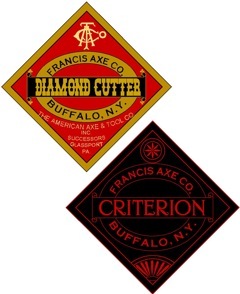 American Axe & Tool Co.
Facsimiles of paper labels used on some axes made and distributed after 1890 by the A. A. 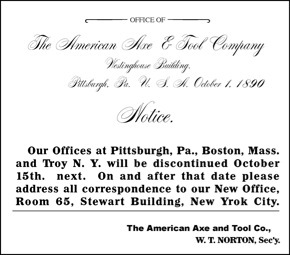 & T. Co.
Label used on some axes made and originally distributed by the Powell Tool Co.
During their first year of incorporation in 1889 and running until October 1, 1890, the American Axe & Tool Co. company offices were located in Pittsburgh, Pennsylvania, Boston, Massachusetts and Troy, New York. Sometime in the late summer of 1890 a notice was sent out indicating that all correspondence should be sent to the new business offices relocated in New York City. By the end of their first year the company also commenced the construction of what was to become the primary A. A. & T. Co. manufacturing center. It was located in Glassport, Pennsylvania. Not long thereafter the corporate offices were also relocated to Glassport. As the Glassport campus grew, equipment from many of the original participating constituent companies was relocated to the Glassport site. As time went on addition manufacturing companies were purchased, primarily to acquire the major manufacturing equipment that was owned by those companies. Some of the original factories continued production for quite some time. This made it possible to maintain production demands while the Glassport facility was being developed. Some of the founding companies, which included those that joined the consortium within the first couple of years, actually had multiple manufacturing facilities. In some cases those facilities continued to be important operate and were often run by the original principals or owners. Many were designated as an A. A. & T. Co. plant with a specific number. References have been observed that included such plants with the highest number being No. 18. There may have been higher numbers but as time progressed some plants, along with their designating numbers, were discontinued and the equipment was relocated to Glassport. Many of what can be called the satellite factories were then abandoned or sold off. As noted, not all of the manufacturing equipment was relocated to Glassport however, at least not right away. One example was the equipment from the Underhill plant in Nashua, New Hampshire. It was relocated to Douglas, Massachusetts and combined with the facilities of the Douglas Axe Mfg. Co. thus expanding the manufacturing capabilities at that location. The overall relocation process involving a number of original companies occurred over an extended period of time. This permitted consolidation while expanding production output. It also provided backup production capabilities in the event of fire, a major concern with companies relying on foundry and forging. It is not clear if all the constituent manufactories were eventually relocated to Glassport. In some cases other lesser-known axe and edge tool manufacturers were acquired and added to the consolidation. This diminished the competition while making it possible to acquire manufacturing equipment without having to wait for it to be completely manufactured. At least one other company joined the consortium later. The specifics concerning the fifteenth company are vague but indications are that Van Doren Mfg. Co. joined around 1907. What the Van Doren Mfg. Co. actually made is unknown as is their original location. Although the location is currently unconfirmed, indications suggest that they were originally located in the Pittsburgh area. 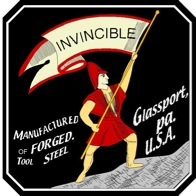 In many cases the relocation to Glassport primarily involved the moving of the usable equipment, machinery and materials from the site of an original factory to the industrial campus being developed in Glassport. Curiously, a fire preceded many such moves. That tended to render the effected structures unusable while much of the equipment could still be relocated. Judging from various accounts and descriptions of what transpired after certain equipment was relocated, it would seem that only selected equipment was relocated and in some instances the facilities were sold off and then acquired and refurbished by someone who reestablished a working manufactory. In some cases the structures were rebuilt in the same place that they had occupied for years. In other cases new facilities were constructed not far from the original manufactory. The remaining salvaged equipment, supplemented by other required equipment, was then set up and the manufactory was put back into production, under a different name of course and not as part of the A. A. & T. Co. Some of the “new” companies did use similar names and/or continued for quite some time. The New York City business office also functioned as the location for a number of “paper” companies. Such companies existed primarily in name only and were used by the A. A. & T. Co. as if they were genuine manufacturing entities when, in fact, they primarily existed on documents, on labels and as marks made by stampings. Such “paper” companies made it possible to have more flexibility with the marketing strategies the parent company practiced. 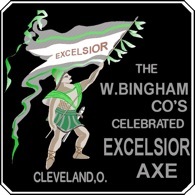 The actual axes were made by one of the constituent divisions of the A. A. & T. Co. but not usually marked as such. By 1891 the total number of the participating companies had grown to 14. Within a short period of time some of the principal individuals that had been associated with those companies became disillusioned with the arrangement and withdrew. Some of those individuals went back into business under their own names or in partnership with others. Some purchased the properties previously occupied by other so called “Trust” members in order to reestablish themselves. The purpose of relocating in or near the abandoned sites can be readily understood when one considers the original factory was so located because there was access to what was needed; power, raw materials, labor and transportation. Technically, all the brands and label designs that belonged to the original individual companies became the property of the A. A. & T. Co. Numerous other brands and labels were also added. This eventually led to significant confusion in regard to who made what and where the tools were made. As the individuals that withdrew started up under different company names, the breakaway companies reintroduced many very similar brands and labels. 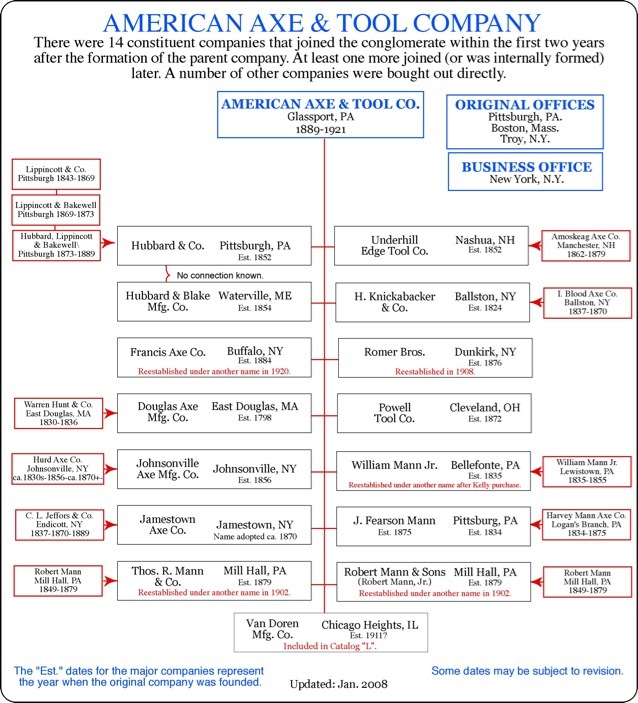 The American Axe & Tool Company grew to be considered the largest axe and edge tool producing entity in the world and for a while that reputation was valid. It wasn’t long before some of the founding members became disillusioned, which reportedly led to infighting. History indicates that legal action was eventually brought against the A. A. & T. Co. under what were called “anti-trust” laws. This influenced a partial reduction and breakup of the company. One of the companies excluded in the original consolidation was the Kelly Axe Manufacturing Co. Quite possibly Kelly actually declined the offer. Whichever is accurate, the fact remains Kelly continued in direct competition with the American Axe & Tool Co. During what amounted to more than 30 years the Kelly Axe Mfg. Co. continued to grow and in 1921 they purchased the A. A. & T. Co. and all of its assets including equipment and the rights to use the patents, brands and labels that the A. A. & T. Co. had developed and/or acquired. Each of the constituent or original founding companies has a history of its own. Some are extensive and include a considerable amount of related information. Others are quite vague. In a couple of cases one might get the impression that a company was primarily formed with the anticipation of becoming part of the conglomerate that became known as The American Axe & Tool Co. It would be highly impractical as well as impossible trying to depict all the labels associated with American Axe & Tool Co. In addition to axes other edge tools were made including major amounts of scythes. Most of the company’s tools were marked in one way or another. Markings and identification included stampings, etchings (embossings) and paper labels. Not only was the A. A. & T. Co. name or mark used, so too were many of the brands and markings of the constituent companies. Add to that the labels used by the “paper” companies and those used by major wholesalers and distributors that bought edge tools in bulk from the manufactories and it should become quite clear that a complete index is wishful thinking. Example of a paper label (top) used by the A. A. & T. Co. and a paper label used on some axes sold by the W. Bingham Co. strongly suggesting that at one time W. Bingham obtained axes from the A. A. & T. Co. or one of its constituent companies. The W. Bingham Co. was a wholesaler. 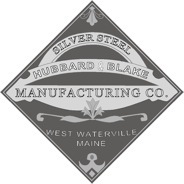 Representation of an etching commonly used on Hubbard & Blake Mfg. Co. axes, possibly later distributed by the A. A. & T. Co.
Facsimiles of paper labels used on some axes made and distributed under the Hubbard & Co. name. The Lippincott & Co. name was a carryover from when Hubbard & Co. took control of Lippincott & Co.
Facsimiles of paper labels used on some distributed after 190 by the A. A. & T. Co.
Facsimiles of paper labels used on some axes made and distributed by the A. A. & T. Co. after 1890. The Red Warrior label was used by William Mann while a number of other Mann companies used variations, some of which were very similar. 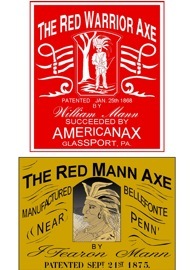 The Red Mann Axe label was used prior to the Red Mann Brand being adopted by the A. A. & T. Co. Example of stamped markings (above and left) used by the A. A. & T. Co. along with a paper label used on some axes and hatchets. The Johnsonville Axe Mfg. Co. used the name HURD on many axes they made and distributed. The A. A. & T. Co. continued the label use for a time. 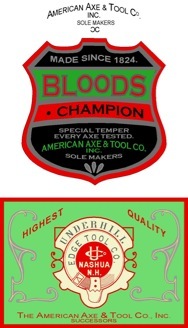 Underhill Edge Tool Co. label adapted from early labels comprised primarily of center design. 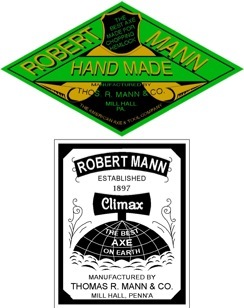 Both Robert Mann Jr. & Co. and Thomas R. Mann & Co. continued to use labels associated with their father after he had given them their own factories. The A. A. & T. Co. continued to use label adaptations from both. 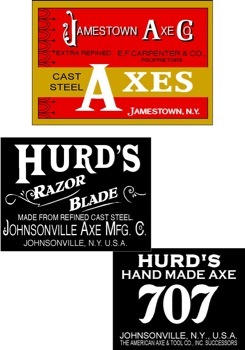 The Jamestown Axe Co. was the more common name used for C. L. Jeffords & Co.
Knickabacher & Co. used I. Blood’s name on many of their labels. A. A. & T. Co. continued that policy. Organizational chart showing the original constituent companies that joined between 1889 and 1891 plus one other company that was listed in the 1911 Export Catalog. The companies in the red boxes represent the concerns to which company establishment was attributed. 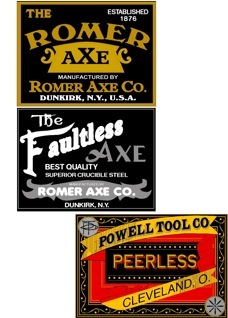 The label facsimiles included are representative of those either used prior to or adopted from the various companies before they became part of the American Axe & Tool Co. Most were very similar to labels used earlier. As time went on some continued to be used, some were modified and some were dropped altogether. 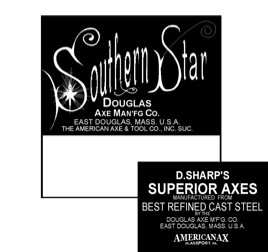 Scores and possibly hundreds of other labels were applied to axes made by the American Axe & Tool Co., many of which were designed specifically for distributors and wholesalers.